In 1859, an Industrial School for Boys was established at Park Row (Park Road until c.1863), Bristol, by Miss Mary Carpenter, a leading light in the Reformatory School movement and founder of the nearby Red Lodge Reformatory for Girls. Industrial Schools, introduced under the Industrial Schools Act of 1857, could receive children aged from seven to fifteen years who were convicted of vagrancy and given a custodial sentence. Unlike Reformatories, the inmates of Industrial Schools were not required to spend an initial short period in prison after being sentenced. The Park Row site was later described as "originally a large ramshackle private dwelling house, joined to other premises formerly belonging to the Medical School ... There are 2 gardens, small one in front and a fair-sized one at the back." The School building was officially certified for operation on June 10th, 1859, with accommodation for 60 boys, subsequently increased to 80. The School site is shown on the 1884 map below. Park Row Industrial School for Boys site, Bristol, c.1884. The School's first superintendent was William Skinner, with his wife Mary Ann as matron. In around 1862, they were succeeded by John and Sarah Langabeer. Miss Carpenter took a very active interest in the School and was assisted by her nephew, Mr W.L. Carpenter, who gave the boys lessons in subjects such as practical mechanics and geography. In 1863, there were around 50 boys in residence who were employed in tailoring, shoemaking, baking and wood-cutting. In the same year, some additional garden was acquired to enable gardening work to be done. Bristol Park Row Industrial School for Boys from the south-east. 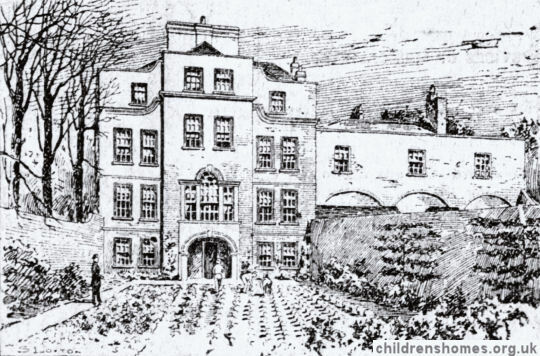 In 1880, the School gained more space by the addition of the neighbouring house. This provided a large schoolroom, better workshops and a good playroom. A cottage at the far end of the garden could be used as an infirmary. A few of the boys now performed their work at the homes of some of the School's management committee. The Langabeers became something of a dynasty as far as Bristol's Reformatory and Industrial Schools were concerned. By 1880, their daughter Elizabeth Ann had become superintendent of the Red Lodge Reformatory, with her younger sister Sarah Jane as schoolmistress, posts they were to hold until the institution's closure in 1920. In 1894, another daughter, Mary, had been been appointed as assistant matron in support of her mother because of the prolonged illness of her father. John Langabeer subsequently died in April 1895 after 33 years as superintendent. Mr E. Chaffey and his wife then took charge of the School. In 1896, the School was described as a "crowded and uneven space... with premises situated on different levels. In the classroom, the boys received generally good reports for geography, recitation, mental arithmetic, word-building and word-binding, and sol-fa and part-singing. Carpentering and joining were about to join the industrial training. Extension motions and musical drill were given every week. Each week, rotating groups of 25 boys attended the public swimming bath and on Saturdays the school walked to the Downs to play cricket or football. A room was being prepared to receive gymnastic apparatus. Visits to the local museum, picture galleries and zoological gardens were made from time to time. A mark system was operating at the School carrying monetary rewards. Prizes of books and useful articles of clothing were given at Christmas for good conduct. Boys who maintained such conduct for three months were allowed to visit their friends on some Sunday afternoons in the year. Each year, the school in two separate parties visited Clevedon for a fortnight's holiday. The School's athletics team regularly did well in competition. 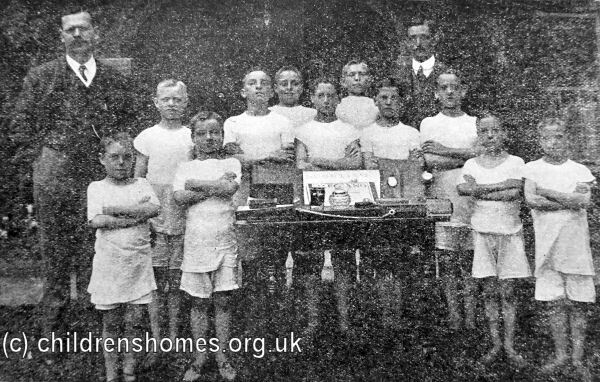 A team from around 1912 are shown below with some of their prizes which included a Meccano set. Mr and Mrs J Franks were appointed as superintendent and matron early in 1902 and were still in post in 1920. The home was officially closed as of March 28th, 1922. This was due, it was said, to an Order by the Home Office following demands for economy by the government.